More customers than ever before are choosing to buy a hybrid mattress for their homes because it gives you the benefits of a regular innerspring mattress and other types of foam such as memory foam or gel. This means that the best hybrid mattress gives you a firm bed which is what most types of sleepers want today. Sleeping experts have recommended that a change of mattress every 8 years is acceptable so if you are looking to change your mattress now, we will be showing you the best hybrid mattresses that you can consider for a great night rest. There was a time when hybrid mattresses did not exist, and people had to settle for either a coil mattress or a mattress made of foam. People who required lumbar support and wanted to be able to move around their bed easily preferred coil mattresses. Others who wanted a soft bed that helped their body pressure points went with foam mattresses. 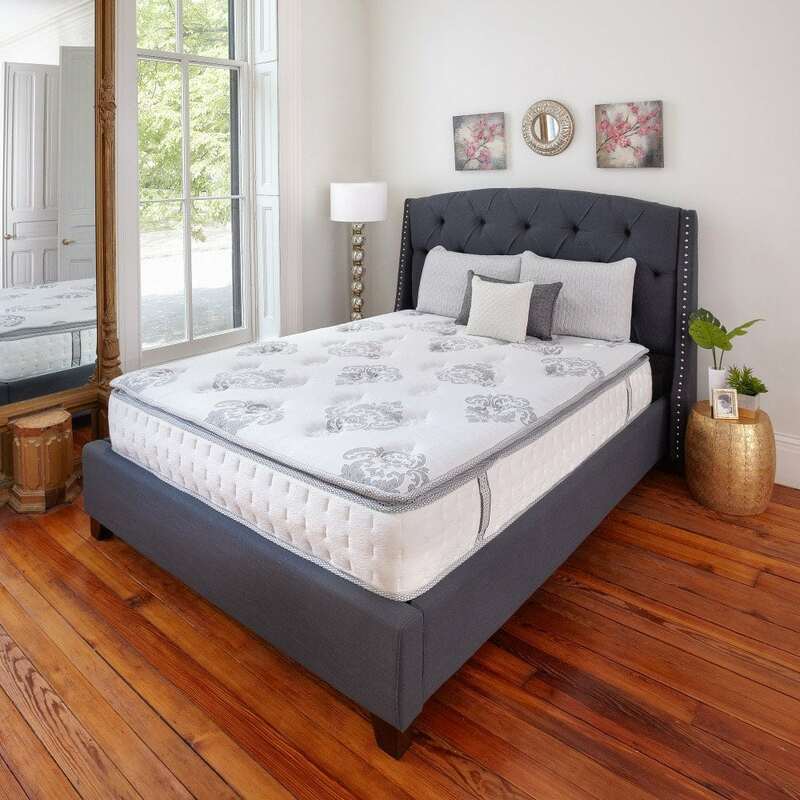 When using a hybrid mattress, you can have both the support of the coil mattress and the pressure point relief that a memory foam mattress offers as the key features of both types of mattresses are in the hybrid mattress in different layers. The support layer of a hybrid mattress is usually made using coils or foam. Coils – this can be done using Bonnell coils, offset coils or any other coil system. Each different coil system used in a mattress has its own unique features in terms of noise and toughness. The most commonly used type of coils is pocketed coils which are excellent with reducing motion transfer, providing body support and contour and makes use of isolated pockets of springs which help the mattress last longer. Foam – Polyurethane foam (polyfoam) is another common choice of material for a hybrid mattress’s support core. It offers some advantages when compared to memory foam in that it can compress and give lumbar support to body pressure points. It is also firm enough to be effective as a support core without increasing the price of the mattress. Polyfoam can also be used as a comfort layer depending on the density of the foam used. Latex – This is a long-lasting, firm and pricy support level. Natural fibers – this can be made from cotton, bamboo or horsehair sometimes. If you change your sleeping position often, stay away from buying a hybrid mattress with a natural fiber support layer. Buckling column gel – Improvements in mattress technology has led to a gel-filled pocket design to make up a support layer in mattresses. This is effective because it provides motion transfer support and pressure point support. Micro/Nanocoils – Think of normal springs but these are much smaller and are in a layer of natural fiber or memory foam. Choosing a hybrid mattress is similar to choosing a coil mattress. Hybrid mattresses also have a coil count which determines how they will feel to touch. While coil count is important, it is not the most important factor when choosing the best hybrid mattress. Here are some other features to pay attention to. What type of mattress suit you and your partner’s needs? 1.5-in layers will act more closely to a coil mattress with a high level of support, comfort, and bounce. 1.5 – 3-in layers will give a mix of both coil and foam with all the benefits of both. These are more ideal for partners with different sleep patterns and requirements. How to judge how long your hybrid mattress will last? The limited warranty that comes with hybrid beds is a great way to know how long they will last. If the manufacturer also provides a sleep trial with a full refund, then you should be sure that the mattress will last. However, some hybrid mattress brands are new to the market, and their extended warranties cannot be verified. Then, in this case, check the density of the foam layer. If a hybrid mattress has polyfoam as its top layer, you should be wary of such products because polyurethane does not last. Memory foam and latex last much longer than poly foam and should be the top of your list. Consider the price of the hybrid mattress also. The lower the price, the higher the chance that the density is much lower than is required in the industry which means that it would probably not last long for you. This mattress is made for relaxing night rests due to its thick layer of cooling gel and memory foam that keeps you cool all through the night. The Arctic Dreams mattress is a cost-efficient option that prevents motion from being transferred from one partner to the order with the help of the individual cases of coil spring in the support layer. With over 1024 spring pockets inserted in the mattress, you are rest assured that your pressure points will receive as much support as they need. You will also find that movement isn’t transferred easily from one side of the bed to another. 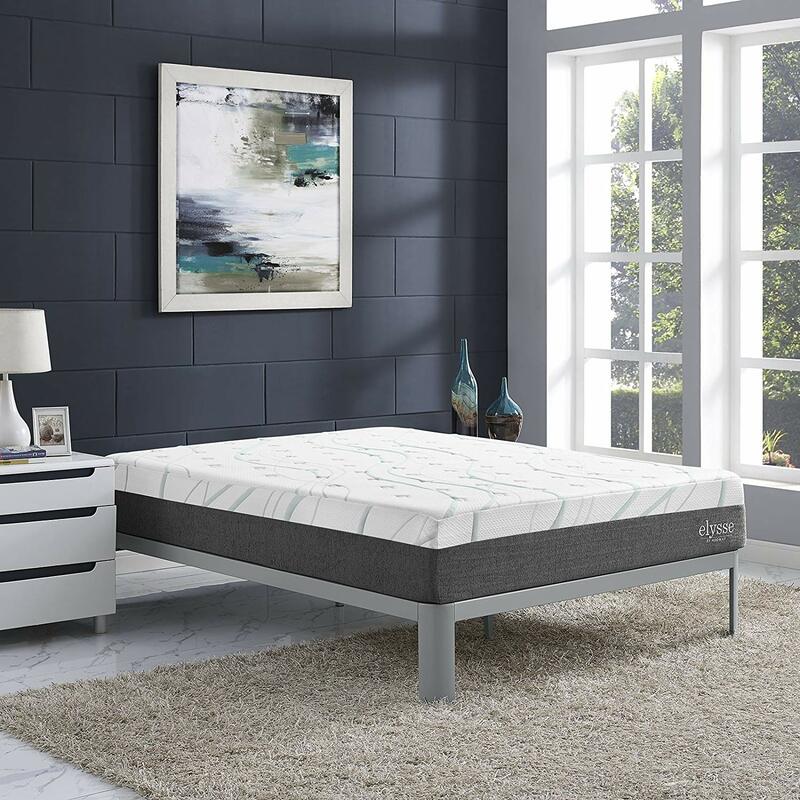 The base of this mattress is made from 1-inch high-density base foam that is combined with Arctic Dreams Energex Gel memory foam. This base layer also contains 6-in pocket coils and is 2.5 inches thick. A mattress cover made of 0.5-in of gentle quilting fabric bring all the layers of the mattress together. Once you sleep on this mattress, you can immediately tell that while it may not feel cool initially, your body temperature will also not get any hotter. This is because the mattress helps to keep body temperature constant all through the night, helping you sleep better. Once you unpack the mattress from the box, give it up to a day to complete regain its normal shape and release any odor that may have been introduced during production and packaging. Arctic Dream mattresses are made locally in the US from top-quality materials. The company also handcraft all the individual parts of the mattress to ensure that they live up to its extremely high standards so that your 10-year warranty gives you peace of mind, no matter how long you use the mattress for. The mattress is also Certi-PUR certified as free from any dangerous chemicals or materials like lead, mercury or ozone layer depleting chemicals that have been deemed harmful to the environment by the Consumer Product Safety Commission. The Elysse Hybrid Mattress is made from three layers of memory foam that are put together to provide a high quality of sleep. The mattress is delivered in a nice compact box which is easy to assemble within minutes for sleep. The top layer of the Elysse mattress is made from gel-infused memory foam. The other layer is made from pocket coils that are packed into a 2.5in foam layer. An advantage of the top layer is that your body heat is spread evenly without getting your bed hot or the mattress unduly uncomfortable. It also provides body support and holds weight effectively. Elysse mattresses also help keep your sleep comfortable by absorbing motion disturbance from your partner, reducing sleep interruptions while providing support to your pressure points. 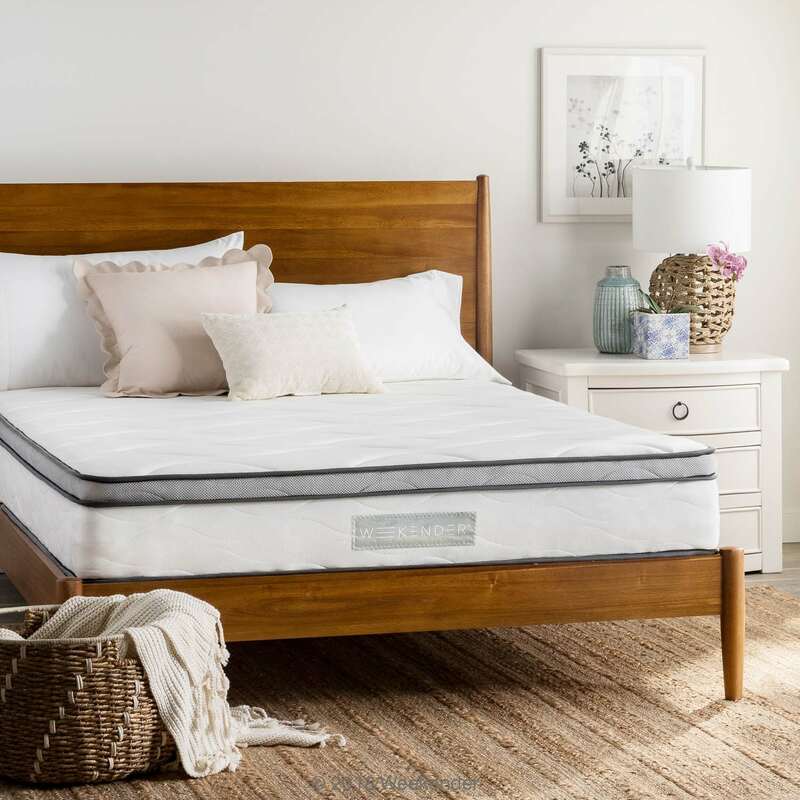 The brand also has all the necessary CertiPUR-US certifications as well as pass marks from respected independent testers, so you know that your hybrid mattress is hypoallergic and free from any harmful chemical to you or the environment. These include mercury, formaldehyde and heavy metals. There are also no flame retardants added so you can rest assured of no skin irritations or reaction. The Elysse mattress is covered with a nice machine-safe diamond quilt mattress cover that is lined with fiberglass cloth. When you receive the Elysse mattress, it is packed into a box and vacuumed so you should leave it for a couple of days so that it can regain its original shape. You can use this mattress without a box spring or a bed base. It can support up to 300 lbs, and you can use a slatted base for it if you choose. Just make sure that they are placed not more than 3 inches apart. The bottom of the mattress is also non-slip, so you may not need edge barriers. 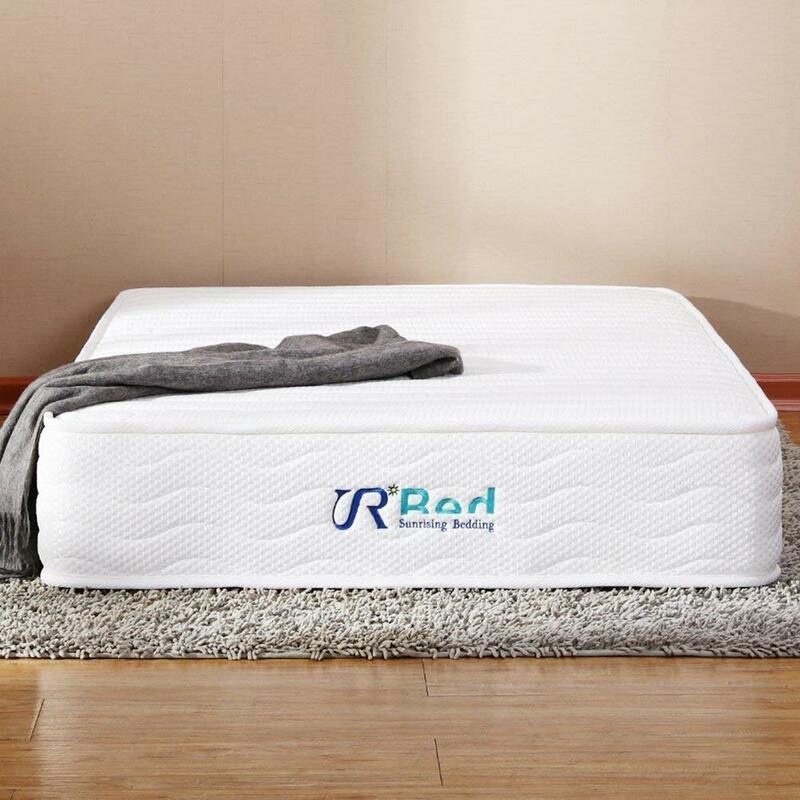 This bed has all the support benefits of a coil mattress and comfort of gel-infused memory foam, all designed to give you relaxing nights that will help you be energized and refreshed in the morning. The mattress cover is a wonderful quilt pillow-top knit cover with cords on the sides and comfortable material that is well-aerated. Overall, you can rest assured that you are getting great value for your money and this mattress will be dependable for many years. The 12-in Hybrid Mattress takes advantage of the wrapped coils in the memory foam to provide body contour support. The top level is made from 0.5-inch gel-infused memory foam that helps to regulate temperature at night and keep your body comfortable and cool all night long. It also provides pressure for your body pressure points. There are three more levels of 0.25, 0.25 and 0.5-inch thick comfort foam that all come together to improve your sleep. There is also another support layer of 8-in coils packed in individual pockets to provide well-distributed support when you lay down on it. The coils also help to reduce disturbance from one partner’s movements being distributed to the other side of the bed, keeping partners more comfortable at night. 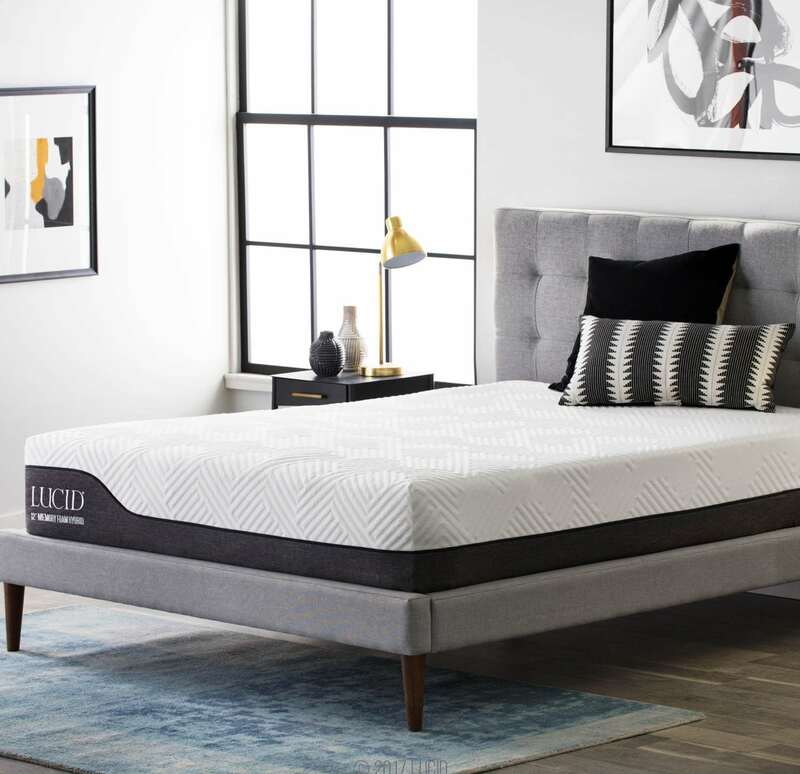 The Mercer hybrid mattress has a support layer that contains pockets of steel coils that are designed to provide excellent body contour and support. They also are important because they prevent sleep movements from one person affecting the other person. Each coil moves on its own, so it can react to your movements at night to provide less transfer of movement to the other person on the bed. It also keeps your body supported and your pressure points relieved. All the materials used in this hybrid mattress are cleared by the CertiPUR-US program as free from any chemicals that could contaminate the environment. This program tests, analyses and certifies materials free from heavy metals, formaldehyde, mercury and a lot of other materials which could cause discomforts or allergic reactions. The tests are performed at independent laboratories, so they are accepted as industry standard for mattresses. Classic Brands mattresses are packed in a way that they do not contain any excess materials. They are rolled up and packed in a compact shipping box at less than 30% of their original size. This means that the company can get the mattress to customers cheaper and quicker without compromising quality or durability during shipping. The mattresses also return to their original shape once unpacked pretty quickly. Classic Brands mattresses are covered by a manufacturer’s warranty for 10 years, so you don’t have to be worried if the mattress has any issues. 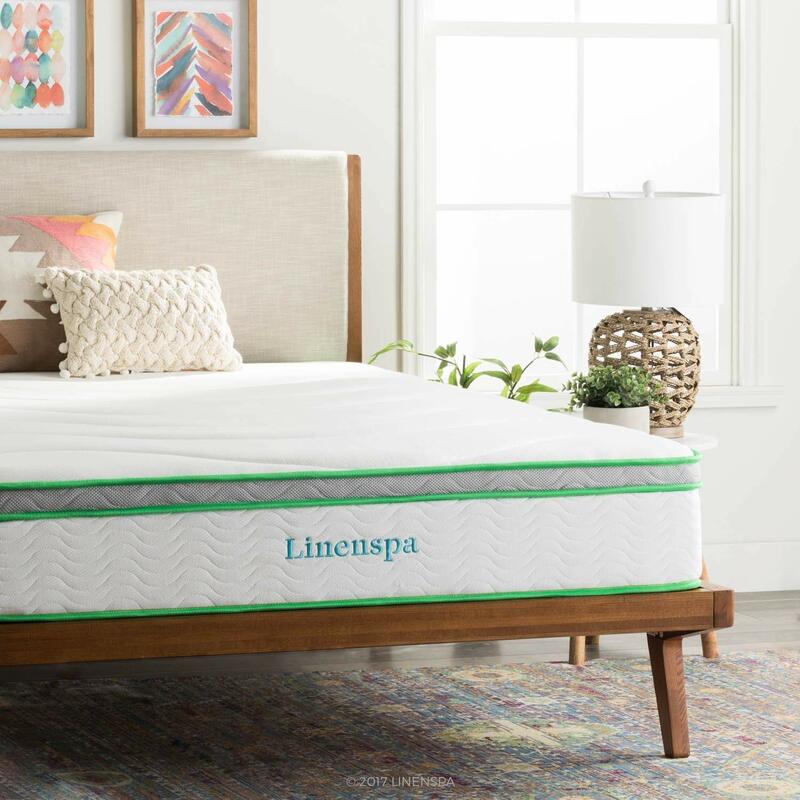 This new Linenspa 10-inch mattress is made to a comfortable medium-firm feeling that is ideal if you sleep on your back or belly. The latex hybrid mattress is made up of four layers of both gel-infused memory foam and latex to provide great levels of support, body response, and contouring to body curves without sagging. Because latex does not retain temperature, this mattress is by far cooler to touch than any all-foam mattress out there. The foundation layer of the mattress contains 7-inch pocket steel coils that help to reduce motion transfer from one partner to another. The mattress cover is made in a modern two-tone style that makes the mattress a lovely fit in any master bedroom or guest bedroom. Linenspa also provides up to 10 years in manufacturer’s warranty so if you notice any factory defects, you can get another mattress with no questions asked. The new Lucid 12-inch mattress containing bamboo, charcoal and aloe vera provides you with a smooth, refreshing feeling every night and helps you stay asleep all night long. This is one of the best hybrid mattresses you can buy without spending too much. The layer of steel coils is laid next to a 1.5-inch later of transition foam that is imbued with Aloe Vera. There is also the third layer that is 2-inch thick and made from memory foam. This layer contains bamboo charcoal. These natural materials help to reduce moisture and odor in the bedroom and help you sleep comfortably at night. The memory foam layers of this hybrid mattress provide body contour and pressure point relief while the steel coil layer provides good support and reduces undue movement. The mattress cover is a two-tone knitted fabric that has a 10-year warranty that covers you from factory defects. You can use this mattress for a master bedroom or for your guest bedroom without issues. This is one of the best hybrid mattresses you can buy that provides everything that coil beds and memory foam beds provide. This mattress is built to suit you no matter your style of sleeping with great comfort and support for your body to help you stay asleep all night long. 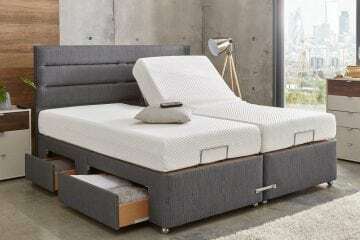 The mattress is made from 3 layers of comfort foam, gel memory foam and a third layer of convoluted foam. The level of support provided helps to keep pressure points relieved, and the also provide lumbar and spinal support to keep you as comfortable as possible. This mattress is designed to provide universal body support such as what is required in a hotel. It is also packed in a classic way, so it looks and feels beautiful to look and feel. 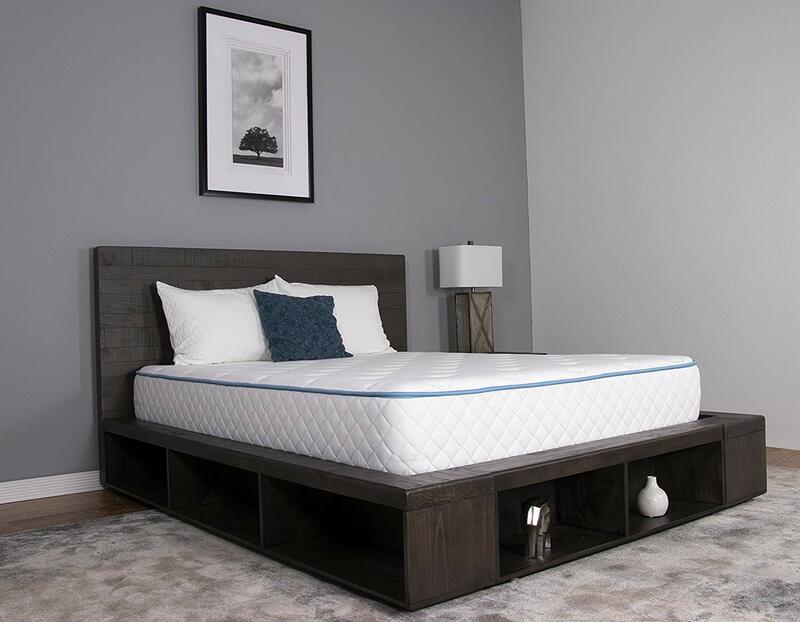 The layers of this mattress are around 10 inches thick alongside the steel coil base of 7.5 inches and another topper of 2.5 inches memory and comfort foam. The Weekender mattress also contains a base layer of individually packed steel coils wrapped in fabric that keeps the edges protected and prevent movement from being transferred from your partner at night, giving you a quieter, more comfortable night rest. This mattress is made from 100% natural latex which is obtained from the Thai Rubber tree. It contains no chemicals like mercury, formaldehyde, odorless and hypoallergenic. The Sunrising mattress also is resistant to dust mites and other insects, does not mold, and helps to keep the body cool when sleeping. The mattress is produced using the Talalay method of latex production which gives latex that is known for being pain-relieving and fire retardant without the use of chemicals. There is a layer of steel springs and coils of 2mm diameter that helps the mattress to stay firm at all times no matter where you are. Bounce in a region or movement during sleep is also not transferred to the other side of the bed which makes it ideal for partners with different sleeping styles. 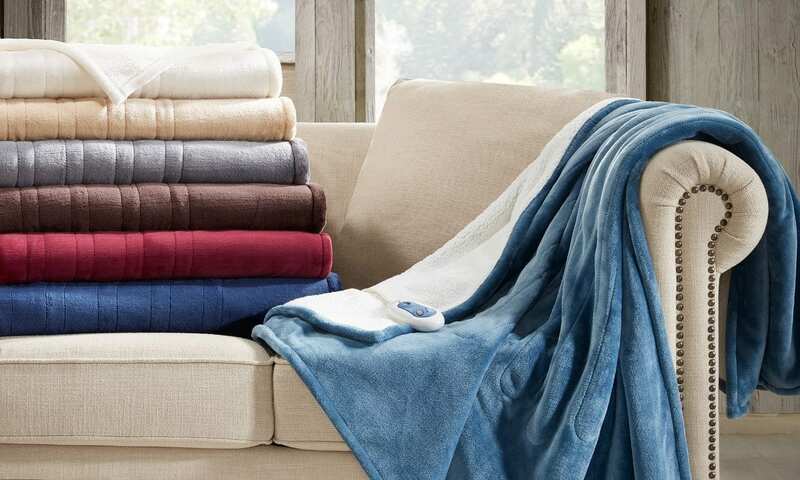 The Cushion-Firm feel is also comfortable and relaxing for the entire body. It can be used for those who require orthopedic support for their muscles even if they sleep on their belly, side or back. Perfect Latex and Coil Hybrid Mattress provides optimal airflow and motion support without costing as much as other luxury hybrid mattresses. You can use the Sunrising mattress with any kind of box spring, foundation, slats or even bunk beds conveniently. Packaging is done by compression and boxing so allow for a few days for it to return to its original size. You have up to 120 days to try the mattress and return if you don’t like it without any questions. All you need to do is just call for a return, and you get a full refund. The mattress is also covered by a 20-year warranty. 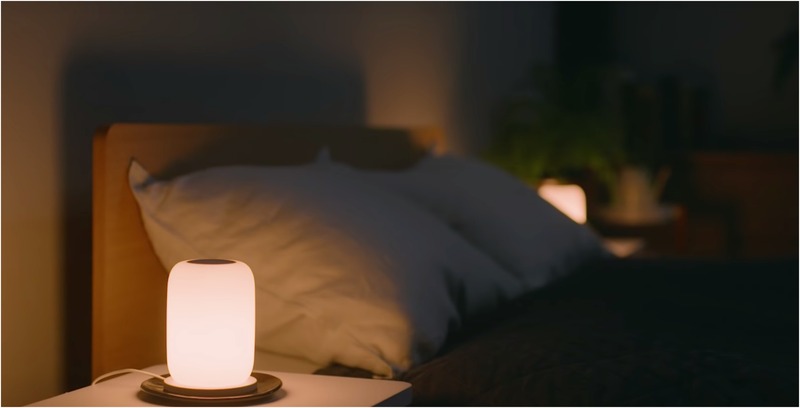 Motion isolation – if you sleep with a partner, then a hybrid mattress will help to ensure that you have a quieter night with less disturbance by your partner’s sleeping movements. Temperature regulation – Hybrid mattress help you stay cool all night long unlike memory foam mattress. Heavy size makes them hard to move. The best hybrid mattress for you will definitely be worth whatever money that you spend on it. Investing in a good night rest is investing in your good health, and that cannot be overemphasized. There are many types of hybrid mattresses in the market, so you have to be more careful when trying to buy one to avoid buying a poor product. That is why we have this list and have helped you to identify the important things to look out for. When choosing the best hybrid mattress for you, look at all your options and requirements to make sure that you take your time to buy what is best for you. When you do this, we have no doubt that you will be sleeping comfortably for a very long time to come!